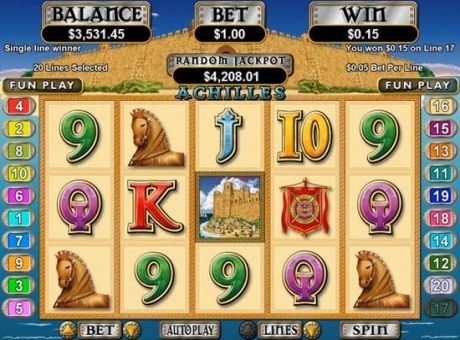 Achilles is a 5-reel, 20 payline slot game with a random progressive jackpot. The game with a particular jackpot should be played at the corresponding online casino (see links). Achilles is an Ancient Greece themed, 5 reel, 20 payline slot machine with Wild and Scatter oportunities, and Free Spin style bonus feature. You will recognise Achilles, Helen, Shield symbol and Trojan Horse on the reels and these symbols bring you winnings. Achilles is wild symbol here that substitutes for all other symbols except scatter Troy. This is also the most rewarding symbol - hit 5 Achilles on paid line to win the top jackpot of 10,000x your line bet. Free Spin Bonus Round 3 or more Achilles symbols award you up to 25 re-triggerrable free spins. Spin the reels of the great-themed online slot right now, no download or registration required to play the free demo on our site. Good Luck! A Progressive Jackpot can be won at the conclusion of any game at random and is paid regardless of the denomination played. However, the higher your bet amount per spin, the better your chances of hitting the jackpot.